This site, situated at the entrance to the Castle esplande on the west wall of The Tartan Weaving Mill, is easy to miss. 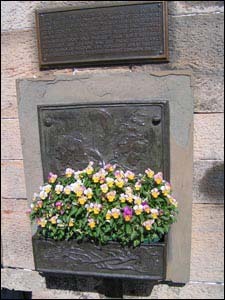 A cast iron wall fountain commemorates the place where over three hundred women were burned at the stake accused of being witches. In the 16th Century more witch burnings were carried out at Castlehill than anywhere else in the country. 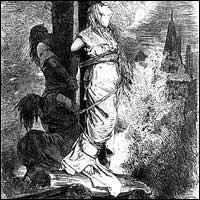 The victims often suffrered brutal torture before being put to death at the stake. They were often nearly drowned by being 'douked' in the Nor' Loch. One of these victims, was Dame Euphane MacCalzean, accused of witchcraft for using a spell to sink a vessel out of Leith, and attempting to destroy the ship of King James VI as it entered North Berwick. "This Fountain, designed by John Duncan, R.S.A. Is near the site on which many witches were burned at the stake. The wicked head and serene head signify that some used their exceptional knowledge for evil purposes while others were misunderstood and wished their kind nothing but good. The serpent has the dual significance of evil and wisdom. The Foxglove spray further emphasises the dual purpose of many common objects."